London South Bank University (LSBU) is leading by example in the battle for higher education institutions to become more sustainable, named in the top third of 154 UK institutions by the independent People and Planet University League. The University climbed 15 places since last year, making it into the Top 50 of the overall results published last week in The Guardian. With huge increases in its scores from 2016 for education for sustainable development activities, carbon reduction initiatives and worker’s rights, LSBU was also named equal 8th among 30 London institutions. LSBU has cut its carbon emissions by more than 43 per cent since 2005, meeting its HEFCE target three years early. 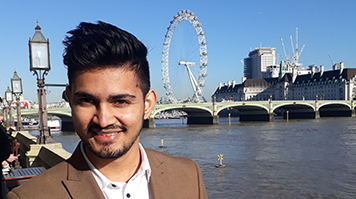 Additionally, the Sustainability Team was a finalist in three categories at the annual Green Gown Awards last week, with student Navdeep Dhuti’s work on a goods-swapping app for the LSBU community earning him a Highly Commended for the Sustainability Champion – Student award. The Green Gown Awards are administered by the Environmental Association for Universities and Colleges (EAUC) and recognise the exceptional sustainability initiatives being undertaken by universities and colleges across the UK and Ireland. LSBU Director of Estates and Academic Environment, Carol Rose, said the recognition of the efforts to improve the University’s sustainability reiterated LSBU was headed in the right direction. “Measuring the extent of behavioural change when it comes to sustainability practices among staff and students on campus is challenging, but judging from the feedback we have received and these award nominations, we firmly feel we are on the right track when it comes to embedding sustainability in everything we do,” she said. “One of our main areas of focus is working closely with academics and building sustainability into the curriculum across many different disciplines, which has been received really well by our colleagues. LSBU has had a number of other recent sustainability successes, including achieving Fair Trade status, becoming an affiliate of Electronics Watch and placing 9th of 152 higher education institute’s assessed by Brite Green. Find out more about Sustainability at LSBU.